Continuing downstream we come to the Keisei Line Bridge. 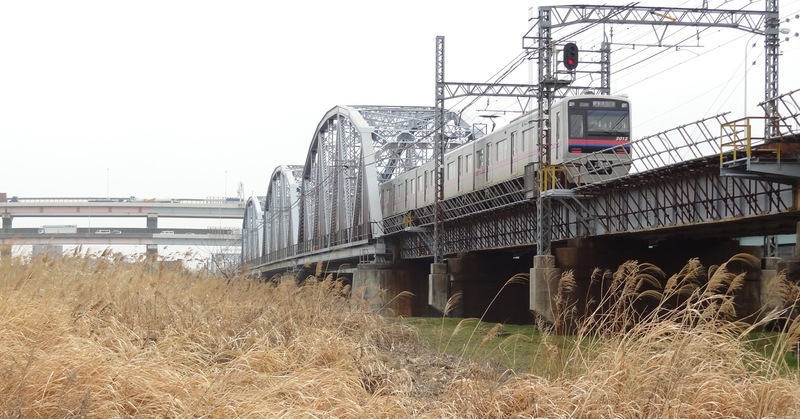 It is a long steel plate girder bridge with three Warren Truss spans over the Arakawa. The bridge is about 1475 ft long and built in 1931. It's next to the Horikiribashi, which we'll look at tomorrow. Tokyo, Japan's Bridges: Arakawa Railway Bridges (3) by Mark Yashinsky is licensed under a Creative Commons Attribution-NonCommercial-ShareAlike 3.0 United States License.